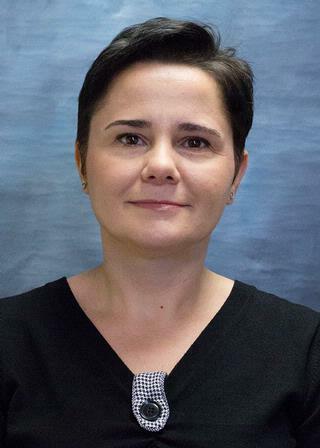 Dr. Tivarus received her BS (1997) and MS (1998) in Physics from the University of Bucharest, Romania. She received her PhD in Biophysics in 2006 from the Ohio State University, where she was trained in MRI and brain imaging. She then joined the Department of Imaging Sciences at University of Rochester as a postdoctoral fellow/instructor in Radiology and was promoted to Research Assistant Professor in 2008. She established the clinical Functional MRI (fMRI) program at the Medical Center, with patient services highly regarded by several departments including Neurology and Neurosurgery. She is in charge of optimization and supervision of clinical MR Spectroscopy protocols (brain), MRI QA/QC testing, ACR (American College of Radiology) accreditation and acceptance testing and provides physics support for the two MRI systems at University Imaging at Science Park and University Imaging Penfield. She also has an appointment with the Rochester Center for Brain Imaging, where she provides assistance to investigators as well as training and supervision of graduate students doing neuroimaging research. Dr. Tivarus gives neuroimaging lectures to Radiology medical residents and co-teaches an MRI class for graduate students enrolled in Cognitive Science, Physics and Neuroscience programs.